Quirky, fun pool floats are the party accessory du jour. You may have even seen celebrities partying with them in exotic locations. 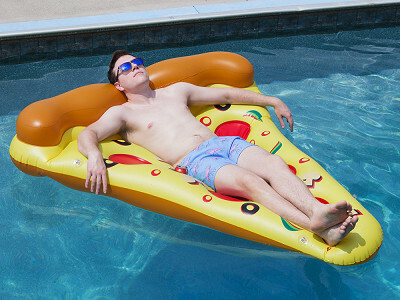 Floatie Kings makes super fun floats in awesomely off-beat designs—even for us non-celebs—in a twist on the poolside staple. The detailed designs feature sprinkles on frosted donuts, or a head rest made of pizza crust, adding to their charm. You and your friends can even wage an epic splash fight while riding jumbo swans. Yes, swans. Founder Jonas Johansson noticed floats becoming popular, but felt like most weren’t built very well. His trendy shapes stay afloat thanks to extra thick material—and he even inflates each one for 24 hours to ensure it’s air tight. Whether you go for an army of swans or a dozen donuts, these floats will help you rule the pool. Hey Grommet fans! 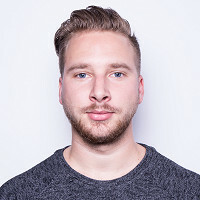 My name is Jonas Johansson, Founder of Floatie Kings. I am excited to have my company and products featured as today’s Grommet. I saw a big gap in the current marketplace for pool floats and with many of them being of poor quality. I set out to create the most premium high quality pool floats on the market but for a fair price! Great floats! How much effort is needed to inflate them? Are the valves capable of being used with air pumps? Is the swan all one piece to inflate or multiple sections? Hey @Eric with a normal pump for air mattresses or hand pump they are simple to blow up, the Swan has 4 different chambers. One for the main body, one each for the wings and one valve for the neck. These are great floats but I see no advantage to purchasing them here. They are the same price at my local, non-discounted, pool store. Obviously we would like for the purchase to be here, Tamsin. But absolutely support your local store. That is a great second option. What weight limit is there???? @Guest the Swan float for example can easily carry two full grown men at 200lbs each! Let's say it's not a flotation device, but 275 lbs and under and you should be good. I''3" 210lbs, what are hiegth weight limits? I'm 6'3" and weigh 210#. What are the height and weight limits? What are product dimensions, etc? Hey @richard the Swan and the Pizza for example can easily carry two adults at 200lbs each! For the Donuts we recommend it for one person. Wow !! These look like so much fun ! Thanks for the sturdy float . I can see I will be enjoying a lot of Pizza this summer !!!! That's me in the photo, Theresa. I can personally confirm they are so much fun. @Theresa Float like a King this summer ???????? Quirky, fun pool floats are the party accessory du jour. You may have even seen celebrities partying with them in exotic locations. 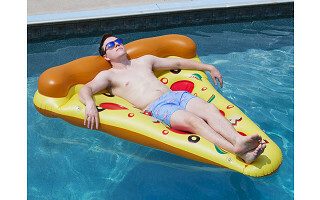 Floatie Kings makes super fun floats in awesomely off-beat designs—even for us non-celebs—in a twist on the poolside staple. The detailed designs feature sprinkles on frosted donuts, or a head rest made of pizza crust, adding to their charm. You and your friends can even wage an epic splash fight while riding jumbo swans. Yes, swans. Founder Jonas Johansson noticed floats becoming popular, but felt like most weren’t built very well. His trendy shapes stay afloat thanks to extra thick material—and he even inflates each one for 24 hours to ensure it’s air tight.